Knives are the oldest tools of manhood. As hand axes they were already used in the earliest traceable history to skin animals and to trench meat. Soon the hand ax was equipped with a handle to handle it easier. 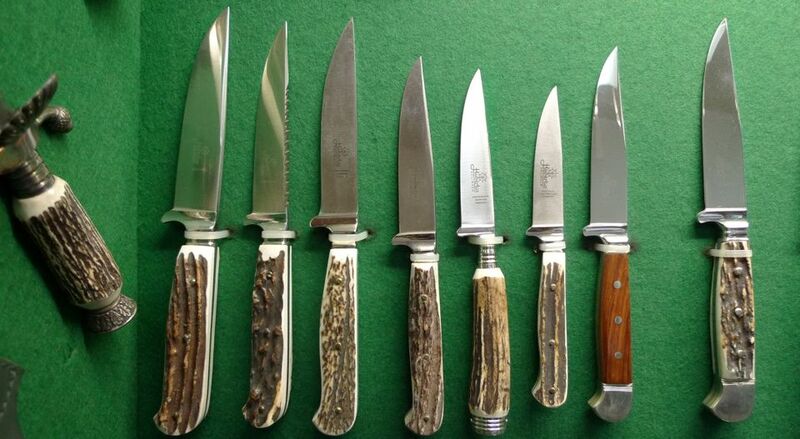 With the introduction of improved manufacturing methods besides knives with fixed blades hunting knives with folding blades and additional components were produced. Our HUBERTUS "fixed bladed Hunting Knives" are characterised by a fixed blade with a flat forged handle part ("flat tang") and riveted handle slabs. Traditionally these knives are equipped with stag horn ("Hirschhorn" (HH)) handle slabs. The handle might be equipped with additional components. Additionally we offer Falconer's knives for the falconry with birds of prey. Falconeer's knives are special fixed bladed knives used for hunting with birds of prey. As the bird brings the living prey animal to its falconer, the animal has to be killed by him/her. The special grinding of the blade allows prevents that the claw of the bird is injured: only the first part of the blade is sharp on a length of 2-3cm while the rest of the blade is blunt in the direction of the handle.